From the ancient period of human cultures, fishing is one of the most loving hobbies till now. Besides, millions of individuals all over the world take fishing professionally. People are enjoying this more when technology touched it with some smart device like Baitcasting Fishing Reels. Now you can fish smoothly and efficiently with the best baitcasting reel which you can buy from online from various sites. Here you can choose the best and most comfortable baitcasting reels for you. Nowadays fishing becomes more and smarter using smart fishing gears. The baitcasting fishing reel is one of the essential fishing gears for every angler. A lot of renowned brands are producing the most intelligent various kind of fishing reel to ensure your smooth casting. Different models and different colors fishing reels are available in online. A strong baitcasting rod will give you a long time fishing pleasure. So you can read the following article and collect the best baitcasting reel to make your fishing more enjoyable. 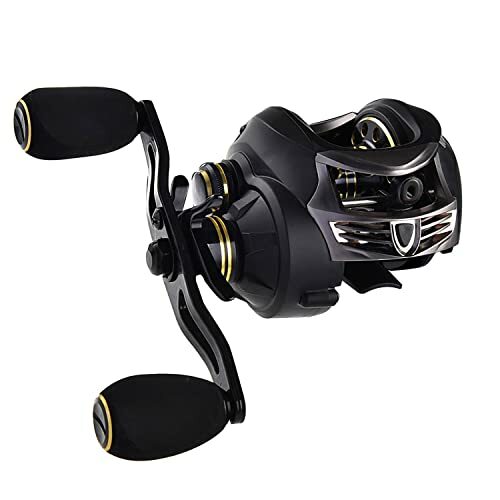 KastKing Royale Legend/Whitemax Low Profile Baitcasting Fishing Reel is the perfect baitcasting reel, and especially it would be amazing for the beginners for its lightness. This will help you to enjoy your favorite hobby at an affordable price. If you start fishing with this stylish reel, it will give you the easiest and mind-blowing experience with its smooth casting mechanism. This carbon baitcasting is for both left and right-handed people. This baitcasting reel has simple features. Adjusting centrifugal and magnetic 10-level dual brake system is secure. There are three main drag settings on this beautiful baitcasting reel. This device is perfect for bass fishing, trout fishing, and ice fishing. This is corrosion resistant, and you may use it for saltwater fishing with proper maintenance. This low profile designed bait caster reel has super silent high speed 7.0:1-line ensures it’s the best performance. It has precision cut brass gear structure. 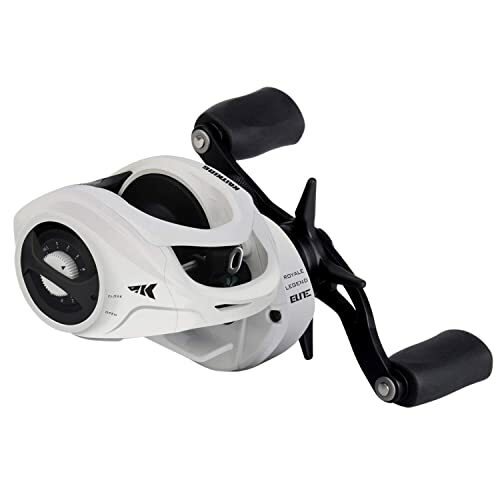 These reels offer a carbon fiber drag system which gives 17.5 lbs. of drag. Its proven 11 + 1 shielded MaxiDur corrosion-resistant ball bearings ensure smooth casing, retrieve and long life. This new Royal legend bait caster is exceptional for its state-of-the-art dual brakes which give you the easy way to fine tune the device. Piscifun Torrent Baitcasting Reel is the best baitcasting reel. Its magnetic brake system mechanism gives you the smoothest casting facility. These torrent baitcasting reels have fast and powerful retrieve which offer the ultimate fishing experience. This machine has CNC machined brass gear which ensures strong drag system and durability with a 7.1:1 gear ratio for you. You can make the switch from right hand retrieve reels, and its lineup of reels gives both affordable and enjoyable switch. This pretty good looking reel has tension knob clicks with adjustment. This great reel is now with an aluminum thumb bar. This high-quality reel with excellent upgrades is for your most relaxed and enjoyable fishing. This reel has 6 super smooth bearings and 3-layer high-grade carbon fiber drag washers which provide an ultra-strong 18lbs drag system. 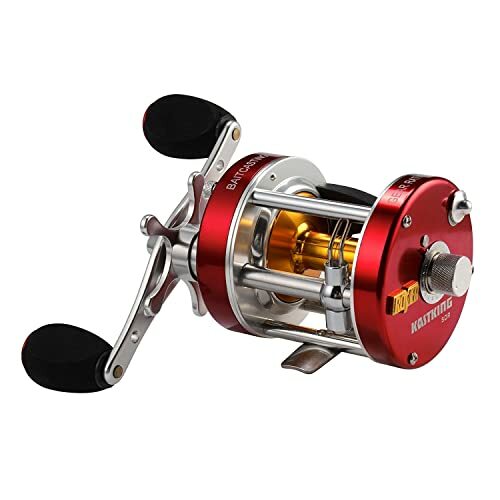 Corrosion resistant and superior quality stainless steel bearings ensure the smoothness of the reels. Its accurate & useful 0-10 magnetic brake provides ready adjustment facilities. This machine has double line winding shafts which increase the durability and stability of the winding. Its 4.33 inch extended aluminum crank handle can pull the biggest fish. The KastKing New Assassin Carbon Baitcasting Reel is the lightest baitcasting reel ever found in the market. This extreme weight saving carbon construction body reel gives you the most comfortable and easy fishing facility. It weighs 5.7 ounces (163.5 grams) only! Besides, an excellent option for its reasonable price. And, you will be amazed at its ‘bulletproof’ body. You can go with it in any fishing and cast all day long without fatigue. 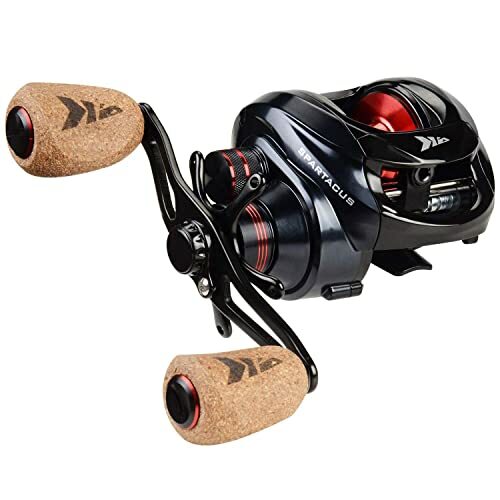 This New Assassin Carbon Baitcasting Reel is the smart choice to enjoy your fishing hobby. You might go for Midnight black finishing with this. These amazing reels are now available for you with one year warranty. These impressive reels have 4 disc carbon fiber 16.5 Lbs. (7.5 Kg) Drag system. 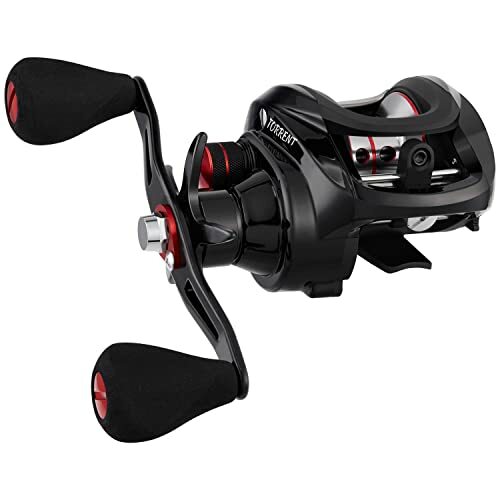 It has dynamic 6-pin centrifugal and magnetic brakes which give you casting accuracy. You can hit the bullseye every time even with wind drift. Its ball bearings are corrosion resistant. This fabulous machine has a powerful 6.3:1 ratio gears, aero-grade aluminum spool, and unique hook sets. It will help you to throw a long distance. This super-fast assassin reel would be an excellent choice for your fitness fishing. The Lews Fishing Tournament MB Baitcast Reel is great for tournament bait casting. This new Multi-Setting Brake system reel is reduced weight designed. Now the weight is 6.7 ounces only! If you are searching for the perfect tournament reel, this reel would be the right choice for you. This tournament reel is excellent for crankbaits. This MB series is built on Lew’s LFS platform with improved strength just for you comfortable casting. It has smooth operation and one-piece aluminum frame. This machine features with aluminum U style spool, graphite side plate, and aircraft-grade Duralumin drive gear. 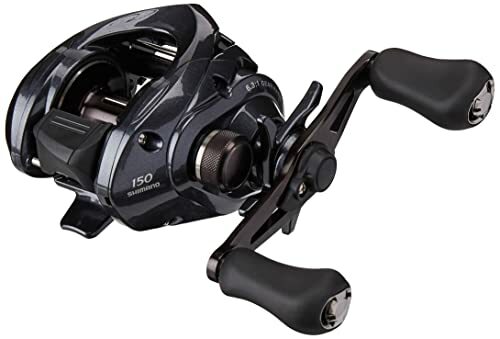 This impressive reel has premium 10 double-shielded stainless steel bearing system and an internal 4-pin position on/off Centrifugal Brake System. Besides, you can pick your favorite one from different models in different gear ratio. This device features high capacity spool and a 95MM power crank handle. This Lew’s reel will fit in your hand perfectly and gives a balanced casting with the rod. Because of its lightweight, you can cast repeatedly. You can adjust this advanced technology device to your style of the cast! The KastKing Royale Legend Baitcasting Reels – Elite Series are mainly designed for competition. These fantastic new Elite series are the smallest reels ever from KastKing. These full-featured reels are made for your easy and comfortable casting. The palm perfect compact design easily fits into your hand. This machine was developed to ensure your tournament ready high performance for bass fishing. 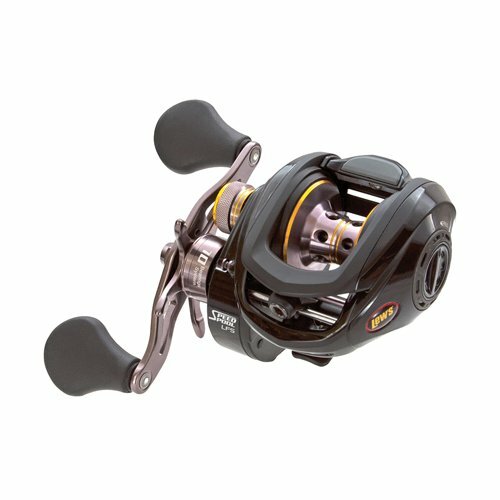 It has the color-coded gear ratio system which gives you specific fishing techniques and conditions. You can choose the most efficient reel for you because each reel has an individual color matched to a gear ratio. There are 4 different gear ratios in this series. These are 7.3:1 (black), 6.6:1 (blue), 5.3:1 (white), and a super fast 8.1:1 (red). This ultra-smooth device used 11 double-shielded, stainless-steel bearings, and one instant anti-reverse. This elite series has durable brass pinion gear and worm drive. It provides up to 17.6 lbs of fish stopping power with great carbon disc. There are 5 magnets in the magnetic casting control system with 10 adjustment settings which give you backlash control power. This reel ensures your consistent performance for fresh and salt-water fishing. The KastKing Speed Demon 9.3:1 Baitcasting Fishing Reel has broken the previous casting speed records already. Now, this is the world’s fastest fishing reel for you. It offers you the most effortless casts and smooth, speedy retrieves. This fabulous device is with 9. 3: 1 gear ratio and precision matched brass gears mechanism. It provides you with the lightning fast casting facility. Its revolutionary design, tournament-magnetic brake system, and easy adjustment ensure your total control on it. This fantastic device reduces the backlash with its cross-drilled aluminum spool. This baitcasting fishing reel has the high-torque 115MM handle and shield 12+1 MaxiDur corrosion resistant ball bearings. 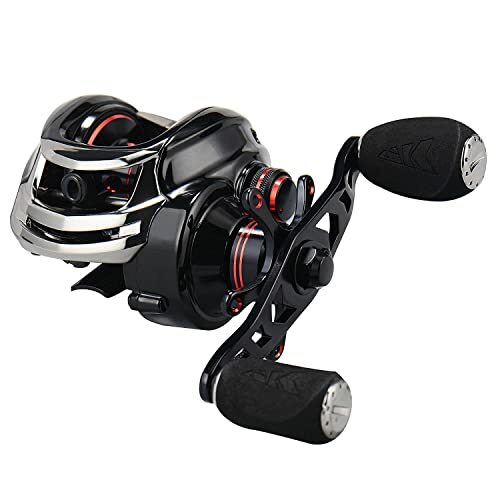 It also comes with some incredible features as the extra durable stainless steel main shaft, 3-disc carbon fiber star drag system, and 13.2 lbs/ 6 Kg drag power. This low profile casting reel provides enough magnetic brake adjustments. Besides, it is perfect for freshwater bass fishing, ice fishing, and trout fishing. This device is unbeatable for its speed and price. If you are searching for a great topwater reel, this reel would be a smart choice for you. The SHIMANO CASITAS, Low Profile Baitcasting Freshwater Fishing Reel is the best reel for bass lake or inshore saltwater fishing. This great casting reel ensures your super smooth and comfortable casting. 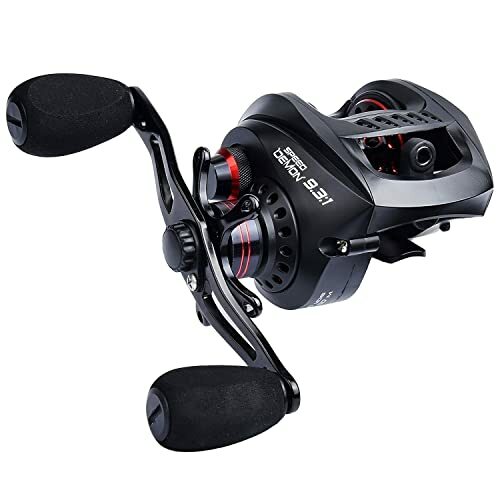 This beautiful machine is ready for your favorite bass lake or inshore saltwater fishing with its versatile performance ability — the Casitas baitcasting reel features for smoothness and easy casting. Your favorite company Shimano Casitas made this lovely device using advanced technology. This is low profile enough for you and its drag works great. The retrieve is so quiet and reliable. This device is equipped with 4 ball bearings and one roller bearing. Which ensures your super smooth casting? This machine is effortless to manage for its outfitted SVS infinity. When you use the lighter lures the spool control, and brake force will control the spool speed. It is S3D Stable Spool designed which improves the spool balance for reducing vibration. Because of this mechanism, you will enjoy a comfortable and balanced casting. It has the brakes on the outside. Overall, this is the most innovative product for you. The highest rated conventional casting reel is KastKing Rover Round Baitcasting Reel. This stylish reel is bulletproof, newly designed and improved just for your enjoyable casting. This powerful reel will amaze you with its superior carbon fiber drag system. The attractive red side plates and spool are made from high-grade aluminum. The brass worm shaft is precision machined and has stainless components which provide you with the most comfortable and super corrosion protection even in salt water! This is your perfect weapon in all forms of fishing. KastKing Rover Round reels offer you all the necessary tools for tournament casting. Now it provides smooth drag up to 20 LB / 9 KG. This reel has fatigue reducing nonslip EVA grips. Besides, its thumb bar, clicker alarm gives it a classic look. The stainless steels race ball bearings ensure its smooth operation. The 2-pin centrifugal brake (size 40-60) provides great casting facility even in salt water. These conventional reels are built with functionality to last a long life to ensure your reliable casting. So, this high-performance device is for you in trolling, bottom fishing and other techniques. 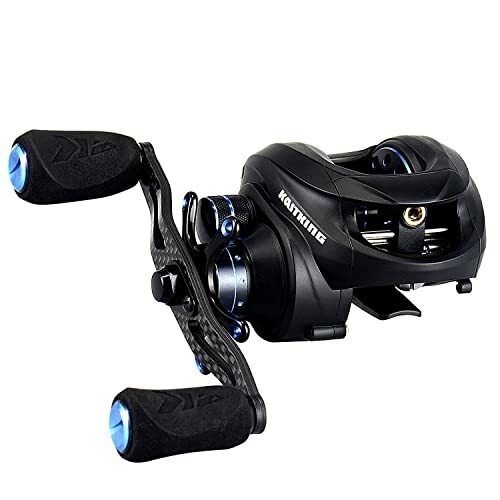 KastKing Spartacus PlusBaitcasting Fishing Reel is the best warrior baitcasting reel you can find ever. The KastKing offers this great device at a remarkable price. Its dynamic features provide you with the best fishing experience in the battle. You will be impressed certainly with its new magnetic and exceptional micro-cast dual centrifugal brakes. This Spartacus reel is smoother and more powerful in its price range than any other brands. This stylish machine has the stopping power of 17.5 LBs trophy fish with tournament ready carbon fiber drag. It has CNC machined aluminum spool and superior shielded (11+1) corrosion resistant ball bearings which ensure smoother casting. This device features powerful brass gears and instant stop anti-reverse hook sets. Besides, it has both left and right-hand models with rubber cork handle knobs. The versatile 6.3:1 gear ratio mechanism gives you a different fishing experience. This exceptional device saves your money and provides you with tension-free fishing pleasure for years. KastKing is here for you with the super lightweight baitcasting reel. This KastKing StealthBaitcasting Reel ensures its users the easier casting with the proper fishing line. It has a new stealth carbon body which is 20% lighter than the previous set. You have the casting facility around thousands of times in a single day! This device offers you smooth cranking and nice drag. The small price of it makes the device more attractive. This powerful carbon body device is stronger than steel. It offers you a lighter body than aluminum. It is 100% corrosion resistant. This reel has 4 carbon fiber discs with 16.5 lbs / 7.5 kg dynamic stealth’s drag system and the aluminum washers give you the whopper-stopping dragging power. This super device has a high performance of a 7.0:1 gear ratio mechanism. The sure-grip EVA knobs offer you the nonstop performance reels. It has the maximum 7 magnet brake system than other brands reel. This reel allows you to tune your brakes for any conditions and any baits. If you are searching for a smart fishing reel, this reel would be the best choice for you. There are so many companies who are producing the smart baitcasting reel for you. Day by day they are developing their devices to give you a stylish baitcasting reel. We hope you have already collected the best baitcasting reel for your next fishing adventure! We believe these fabulous fishing reels will ensure your smooth casting as they are designed perfectly and technologically advanced. These beautiful baitcasting reels are available online to make your fishing more enjoyable and comfortable. Happy fishing!